After the March 26 arrest of the man who allowed a giant illegal supergraphic sign on his Hollywood building, The Wrap, which covers Hollywood entertainment news, published an article about the predominance of ads for TV shows and movies on illegal signs around the city and the fact that advertisers aren’t held responsible for the actions of media agencies, sign companies and others involved in the illicit placement of these ads. Who are these advertisers? 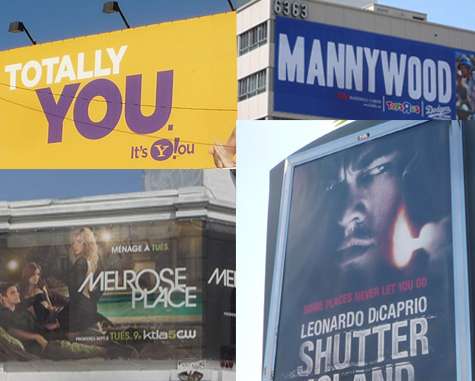 We did an informal survey over the past year of billboards and supergraphic signs known to have been put up without any city permits or inspections, and as The Wrap stated, the majority have carried ads for movies and TV shows. Consumer products and services by major corporations like Apple, McDonald’s and Chase Bank were also prominent. The survey was not comprehensive, but covered signs in a wide area of the city, so we’re confident that it provides a fairly accurate look at the kinds of things being advertising on billboards that were never permitted and inspected for compliance with structural and electrical codes, and supergraphic signs that were never permitted or inspected to determine whether they were securely attached to their buildings and didn’t pose a fire hazard for people living or working inside. Here’s the list. Again, these are only advertisers seen and documented on unpermitted signs over a roughly one-year period. There may be many others. Alcon Entertainment, CBS, Columbia Pictures, CW Network, Disney, Dreamworks, Fox Entertainment, Europa Corp, HBO, Imagine Televsion, Kitson LA, Lionsgate, NBC, New Line Cinema, Paramount Pictures, Showtime, Sony Pictures, Style Network, Touchstone Pictures, Travel Channel, Warner Bros., Versus, Wingnut Films, 3 Arts Entertainment. Electronic Arts, Dolby Laboratories, MySpace, Operation Sports, Rockstar Games, Sirius Satellite Radio, Yahoo! Absolut Vodka, Apple, Asics America, Dasani Water, Del Taco, H&M Clothing, HTC cellphones, Chase Bank, Hewlett-Packard, Ing Direct, Maker’s Mark, McDonald’s, Microsoft, Miller Brewing, Naked Juice, Nike, Nordstrom, Pepsi, Red Bull, T-Mobile, Tiffany & Co.